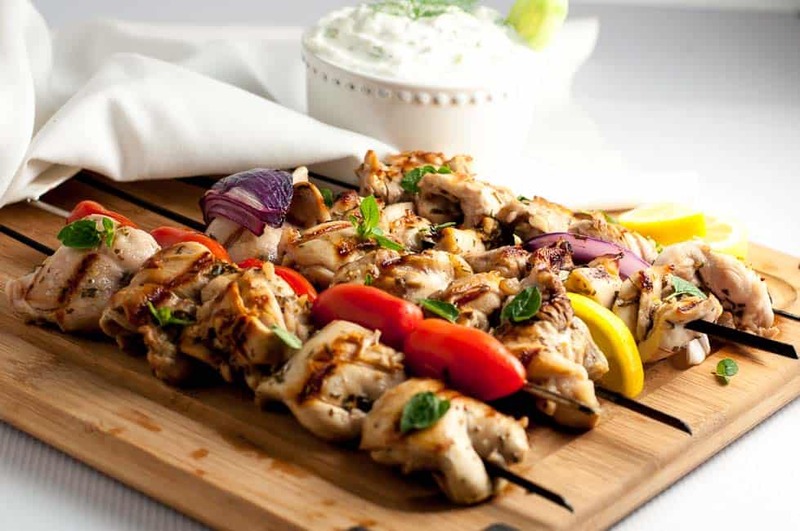 Juicy Greek Lemon Chicken Kabobs make an easy, flavourful meal-on-a-stick! Serve with homemade Tzatziki Sauce. Summertime is grilling time! Food tastes so much better when eaten outdoors, don’t you think? 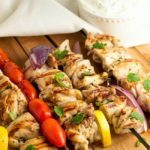 These Greek Lemon Chicken Kabobs made an ideal outdoor dinner-on-the-deck and had me reminiscing about sultry nights in Athens years ago. Life was laid-back and easy and required nothing more than relaxing in outdoor cafés, eating gyros and souvlaki on the street, and sipping retsina in cozy corners. Isn’t it amazing that smells and tastes can trigger memories so strong it feels like you’ve been transported back in time? Sometimes when something is simmering on the stove or baking in the oven, long forgotten memories come flooding back. 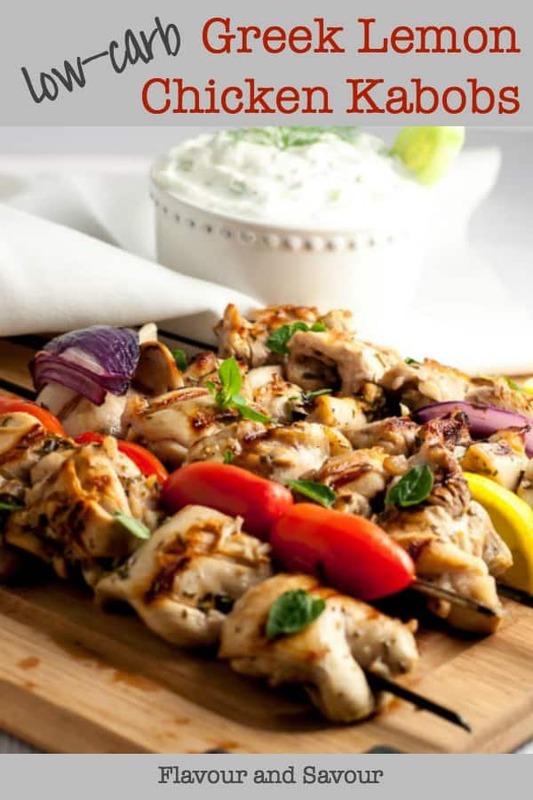 In this case, fresh oregano, pungent lemons and succulent chicken skewers sizzling on the grill evoked memories of warm nights in rustic Greek tavernas. I make these Grilled Turmeric Chicken Kabobs frequently using chicken thighs. I used boneless skinless thighs in this Greek Lemon Chicken Kabobs recipe too, as they’re so dependable on the grill. Unlike chicken breasts, it’s actually hard to overcook thighs. I marinated these chicken kabobs with lemon and herbs, skewered and grilled them and served them with homemade Tzatziki sauce, which we have proceeded to devour on everything since. These Greek Lemon Chicken Kabobs are quick and easy to prepare. Whisk the marinade ingredients together, pour over the chicken and let it marinate while you prepare the tzatziki sauce. If using wooden skewers, place them in water to soak. Prepare other vegetable skewers like tomatoes, peppers and onions and place them on their own skewers. While skewers of meat alternated with vegetables look visually appealing, in reality, they rarely cook evenly. Raw meat and overcooked, charred vegetables are sometimes the unfortunate result. If you separate the meat from the veggies, you’ll be able to control their cooking time and have perfectly cooked kabobs. 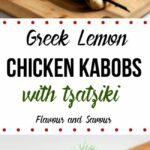 Can I freeze these Greek Lemon Chicken Kabobs? 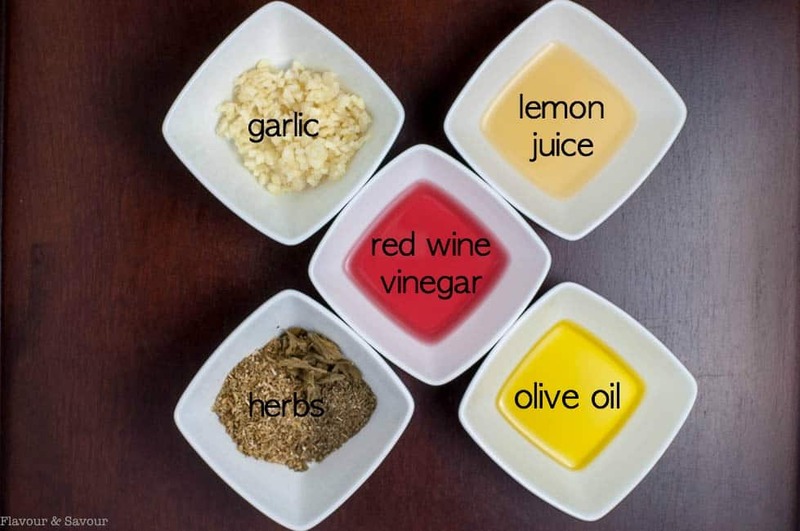 In a large bowl, whisk together the marinade ingredients, then add the chicken and toss to coat. Cover and refrigerate for 45 minutes to 4 hours or even overnight. Thread the chicken on to skewers..
Heat the grill to medium high heat and oil the grates. Grill the chicken for 4-5 minutes per side or until chicken is cooked through and no longer pink inside. Peel the cucumber and remove the seeds with a spoon. Finely dice the cucumber. Pat dry with paper towel or a clean cloth to remove as much moisture as you can so that the sauce isn't runny. In a medium bowl, combine the remaining ingredients and whisk together. Add the cucumber and refrigerate until ready to serve. Garnish with a sprinkle of fresh dill, if desired. Nutrition information does not include Tzatziki Sauce. Nutrition calculations do not include the Tzatziki Sauce as you’ll have more than you need. Use the leftovers as a dip, a dressing, or a topping for baked potatoes. It’s great on grilled fish or other meats, too. Thanks for joining me around our table! 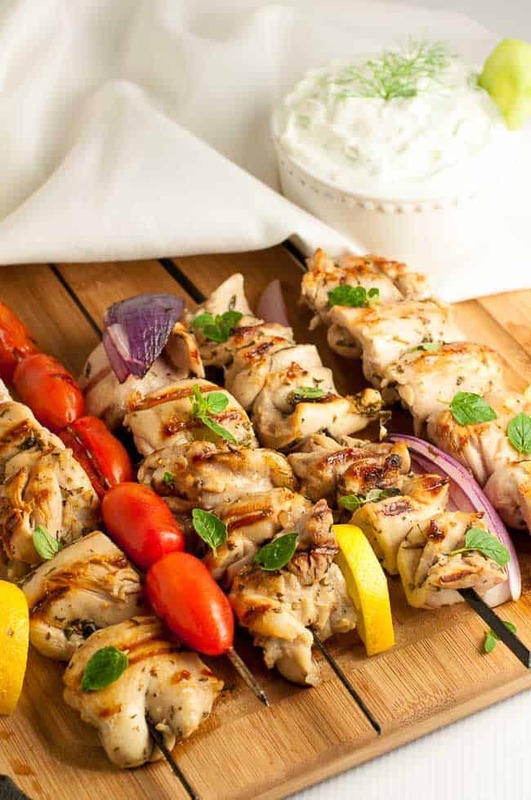 Looking for more recipes like these Greek Lemon Chicken Kabobs? I completely agree chicken thighs are best for the grill. Plus they take on the marinade so much better. Great recipe! Can’t wait to try. Hope you like them as much as we do! Thanks for commenting! 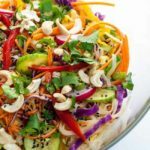 Dreamy summer meal! I too prefer chicken thighs on the grill (and in general). 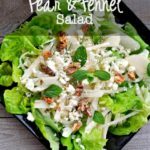 Love the addition of lemon in this recipe!! Brightens it up a bit. Agreed–chicken thighs stay so much more juicy than chicken breasts. Thanks for stopping by! Oh I LOVE kebabs and these with tzatziki are right up my alley! Perfect for summer! 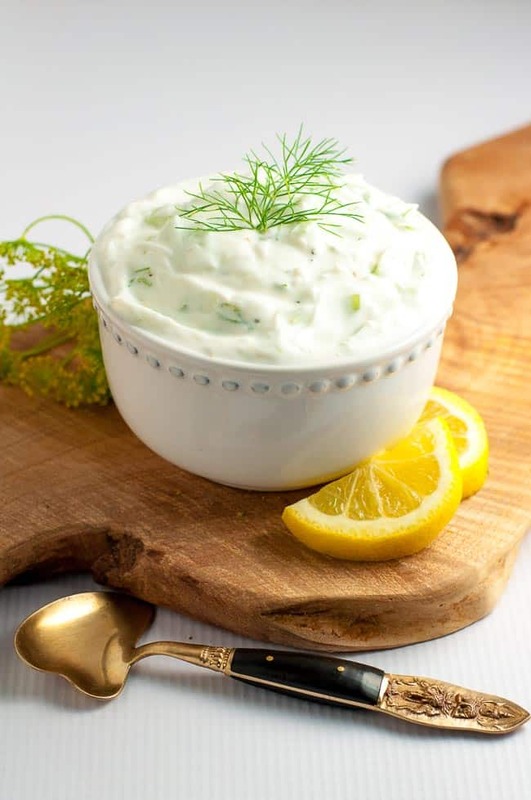 And homemade tzatziki is just so easy to make! I love greek chicken kabobs! 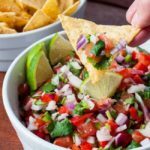 Great summer meal – and easy for a big group! Yes! chicken thighs are the answer to those hard flavorless chicken kebabs made at home. And these Greek kebabs look delish! Will make these soon! Thanks! 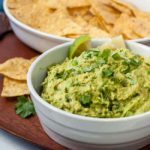 These are quick and easy and they’re become a favourite in our home! Thank you for the recipe. My family love it!!! Thanks for letting me know, Kathy! It’s a favourite here, too!